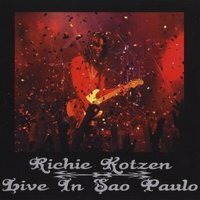 This is the first official live-cd from Richie Kotzen, recorded in Sao Paulo, Brazil in 2007. The band consists, apart from Ritchie himself on guitar and lead vocals, of Johnny Griparic on bass and Dan Patruch on drums. They all know their way around their instruments individually, and do some solid working together as a band as well. The style is not, as I expected (not knowing very much about the past work of RK), so much shred or “show-off”-guitarplaying, but more towards swinging and solid trio-rock, sometimes like Mr. Big and their likes (which Ritchie is a former member of, so maybe not that surprising…), and sometimes more “freestyle” a la Hendrix, or more bluesy stuff. I can’t say I’m a long time fan of Richie Kotzen, but this live recording could be a step towards it – sometimes a live recording is just a (more or less poorly) repetition of tracks you already know (if you’re a fan), and doesn’t bring anything new to the impression of the person or band, or can even be an embarrassing proof, that the band works best in the studio. This is not the case with this recording: the live feeling is strong (also because you can hear a real audience, that also sometimes sings along on the chorus), and RK proof himself to be a good guitarist, also in the live situation, and even a pretty good vocalist. Both to long time fans and new listeners, who want some solid trio-rock and a allround and retrospective view into the work of Ritchie Kotzen, this album will not be a bad investment – recommendable.